Add the wine, stock and bayleaf and simmer for a further 2-3 minutes. Remove the bay leaf. 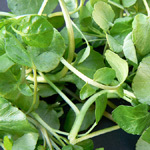 Pour in the cream and chopped watercress. Heat through and season with salt and pepper. If preferred, liquidise before serving. This is fantastic drizzled over salmon, cod or other white fish. Beat the egg, milk, sugar and cinammon until thoroughly combined. Soak the sliced bread in the mixture. While you wait, peel and slice the oranges. Now melt the butter in a frying pan, add the bread slices and fry for a couple of minutes on each side until golden brown. Arrange the orange slices, top with toast and dust with icing sugar. Finally drizzle over some honey and cream or custard if you prefer. Pod the borlotti beans and boil until soft. Drain. Heat the olive oil in a flameproof earthenware pot. Throw in the sprig of sage and crushed garlic cloves and sautee for a minute. Add the tomatoes and cook for 20-25 minutes until the oil separates from the tomato juices. Mix in the borlotti beans. Season with salt and pepper and continue cooking for 15 minutes or so. These beans are good served hot, warm or cold, but never chilled. 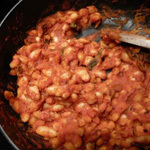 The beans can be stewed with or without the tomatoes. If you like them au naturel, simply omit the tomatoes and add a little water or stock instead. Heat the butter and olive oil in a large frying pan. 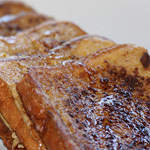 When the foaming subsides, add the white breadcrumbs and stir constantly over a high heat until crisp and golden. Season with sea salt and freshly ground black pepper and the chopped thyme leaves. Tip the mixture into a bowl and leave to cool, then stir in the grated lemon zest. 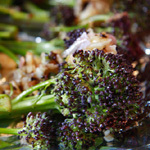 Add the purple sprouting broccoli to a pan of boiling salted water, so the water just covers it. Cook until tender, about 3-4 minutes. Drain and put back in the pan, drizzle with a little olive oil, season with salt and pepper and reheat, shaking gently. Arrange neatly on a warmed serving dish and scatter over the crumbs. Garnish with lemon wedges and serve immediately. 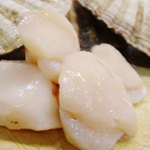 Cut the scallops into slices, 5mm thick, and place in a buttered frying pan. Add salt and the fish stock, poach for 2 minutes, then remove and drain. Add the crème fraiche to the stock and reduce it until it is the consistency of a light soup. Add the chopped spinach and heat for 2 minutes. Then bind with a mixture of the double cream, the egg yolks and the lemon juice. Add the scallop slices and adjust the seasoning. Serve in hot dishes garnished with hot roughly chopped tomatoes.